Where did the idea for this piece come from? When I was a child I saw a kingfisher while catching sticklebacks in a net (for research purposes) and became fascinated by them. I also had a fondness for the sticklebacks that I had placed in a jar and was saddened that the kingfisher would want to eat them. 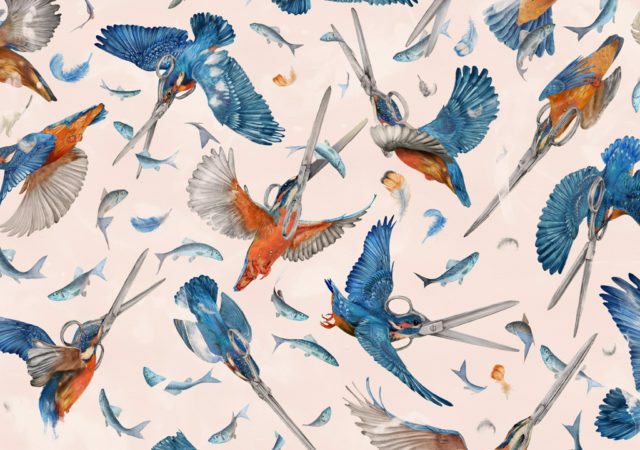 So, I concluded that this couldn’t be the case and that the kingfisher I saw had scissors for a beak and it was catching paper fish. I remembered being told that when earthworms are cut in two they become two new worms. Hence I decided that when the paper fish are cut in half, they become two new fish. Otherwise, how else do you make more fish? I later found out that if an earthworm is split in two, it will not become two new worms! One of many lies I was told as a child. 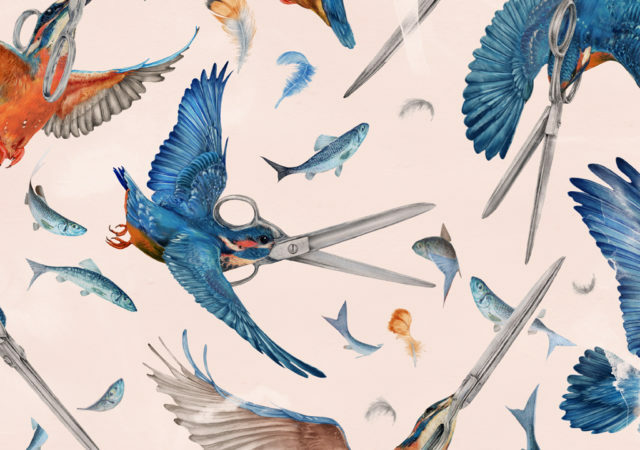 But even now, when I see a kingfisher I still see its beak as a pair of scissors. Do you prefer to leave any interpretation to the viewer, or was there an intention behind the piece? With more detailed pieces I generally leave any interpretation up to the viewer. Did you have to do a lot of research to get the subjects right? No, because, according to Google Images, they don’t exist. Did you use any particular sources for capturing the kingfishers at various stages of flight? I watched a video of a kingfisher. Tried not to get confused with the way a woodcock flies. Woodcocks also have a nice beak, but they eat bits of brown string, or worms as some people call them. Are there any artists who used or use the natural world as a subject for portraiture whose work you admire? I’ve been fascinated by the old illustrations in encyclopaedias since I was a child, I used to spend a lot of time looking over them. Were you not tempted to throw in something representing rocks, so you could have a full game of rock, paper, scissors? No. I don’t trust rocks. They move.